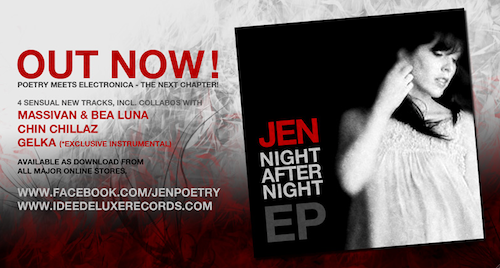 With this, her new 4-track-EP called NIGHT AFTER NIGHT, Washington DC based love poet JEN finally follows up on her amazing MELLOW DRAMAS album from 2008… putting „poetry meets electronica“ back on the map in her own seductive way and with her own distinctive voice. Musical contributors this time around include balearic dj/producer MASSIVAN (providing the title track as well as the haunting „Desire Pt. 1“) and infamous downtempo/dub outfit CHIN CHILLAZ (on the hazy „Blue Smoke“) – both of which have worked with JEN in the past. As a very special (and exclusive) bonus track, the NIGHT AFTER NIGHT EP also includes the tantalizing instrumental version of yet another high class collabo with budapest based producer duo GELKA (of CAFÈ DEL MAR and WAX ON records fame): their flawless stand out tune „Otherwise“ will be JEN’s summer single release, coming up in august (& then including JEN’s words of course as well as a choice of assorted remixes). 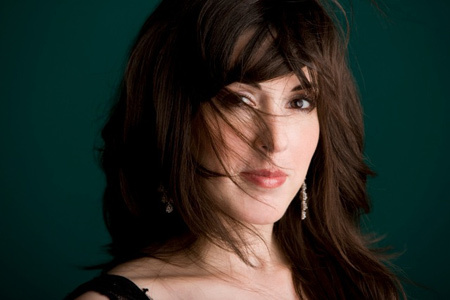 Both this appetizer EP as well as the upcoming single „Otherwise“ are leading up to the long awaited sophomore JEN album by the name of BLOOM & FADE – scheduled for autumn release, getting the finishing touches as you read this and including fresh contributions by a string of other renown producers like a.o. argentinian tango dubster FEDERICO AUBELE (ESL music), cologne based collective SOLAR MOON, and CAN7 aka LEVTHAND just to name a few. So finally, the woman with the one-in-amillion voice is back on the block, promoting love like only a love poet can. And ain’t that just what we all really need in times like these? Well, it sure is.